The TouchWiz music player on the Galaxy Note 10.1 is jam-packed with features and supports a wide variety of file formats, including FLAC and Wave. Music is sorted by the usual Artist, Album and Playlist criteria but there's also Folder support (which is more often found on third party players) - it's quite handy as it saves you the need to sort songs into playlists like on many of the Galaxy Note 3 competitors. The Samsung Galaxy Note 10.1 has a couple of features that will improve your listening experience further. One is Smart Sound, which equalizes the volume between tracks. The other is Adapt Sound - it plays a series of beeps (both high and low frequency) and asks if you can hear them. This way the phone can map the capacities of your specific headset and fine-tune its output for optimal sonic experience. After the calibration is complete, the Galaxy Note 10.1 shows you the kind of gain you're receiving by keeping Adapt Sound on. 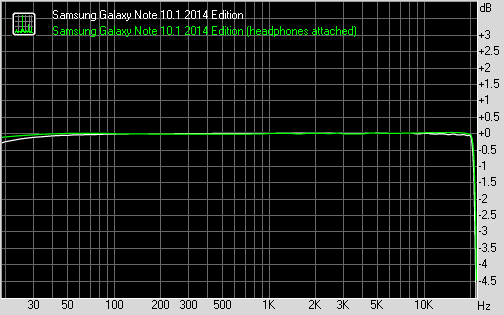 The Samsung Galaxy Note 10.1 2014 Edition did amazingly in the first part of audio output test. It wasn't any louder than the Galaxy Note 3 (so about average in general terms) but it had no weak points to its performance whatsoever. The tablet wasn't particularly bothered when we plugged in a pair of headphones and put in another great performance. The solitary affected reading was stereo crosstalk and even that remained great. While our Galaxy Note 10.1 2014 doesn't have telephony features, we still tested the loudspeaker performance as it will be used for music and videos. It scored a Very Good score and we can confirm the stereo speakers are indeed quite loud. The new video player, found on the Samsung Galaxy Note 10.1 2014 has two tabs - personal (showing you the videos on your local storage) and Nearby devices, which shows the PCs and players on your local Wi-Fi network. The grid view is our favorite as it is really highlights the power of the the quad-core beast - the visible video thumbnails are actually playing the videos instead of being static images. They play at a reduced framerate and generating those previews takes a couple of minutes the first time around, but it's an awesome feature that shows what can be done when you have processing power to spare. Unfortunately, for the first time ever in a Galaxy flagship, the video player doesn't support DivX video and AC3 audio codecs. And while we can forgive the lack of DivX support since those videos are going to be extinct soon, we just can't live without the AC3 audio support. Most of the high-res videos out there use MKV containers with AC3 audio, which makes the video player useless for those. You'll have to opt for a third party app if you want to play such files. We really hope this to be an issue of our pre-production unit, otherwise it would be a shame. The video player lets you choose between three crop modes for how the video fits the screen. The same SoundAlive audio-enhancing technology is available here too. The video player lets you squeeze the best viewing experience out of the large, high-res screen. You can adjust video brightness too. Hovering your finger over the timescroll lets you preview part of the video in a small thumbnail - just like YouTube videos do when you hover the mouse of your computer. Pop up play is here too - it moves the video in a small floating window and you can use other apps on the phone while still watching the video. You can use pinch zoom to adjust the size of the video are move it around, too. 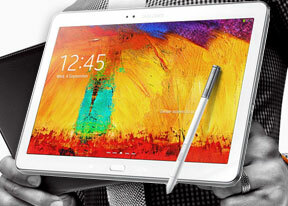 The Samsung Galaxy Note 10.1 offered a list of subtitles and let us pick. It scans for all subtitles, so the file doesn't have to have the same name as the video file.